An illustrated guide to the history of tableware from Poole Pottery. Includes a history of the company and information on the designers. 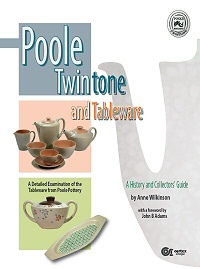 From a collector's aspect, this book will be the definitive guide to Twintone and all the other tableware ranges from Poole Pottery; full explanations on the colours and glazes;	details of the shapes	and patterns	that were developed by the company; the scarcities and rarities; all the backstamps. This second edition includes many updates and new photographs. The book is large-format (280mm x 210mm), 164pp, full-colour, printed on quality art paper.